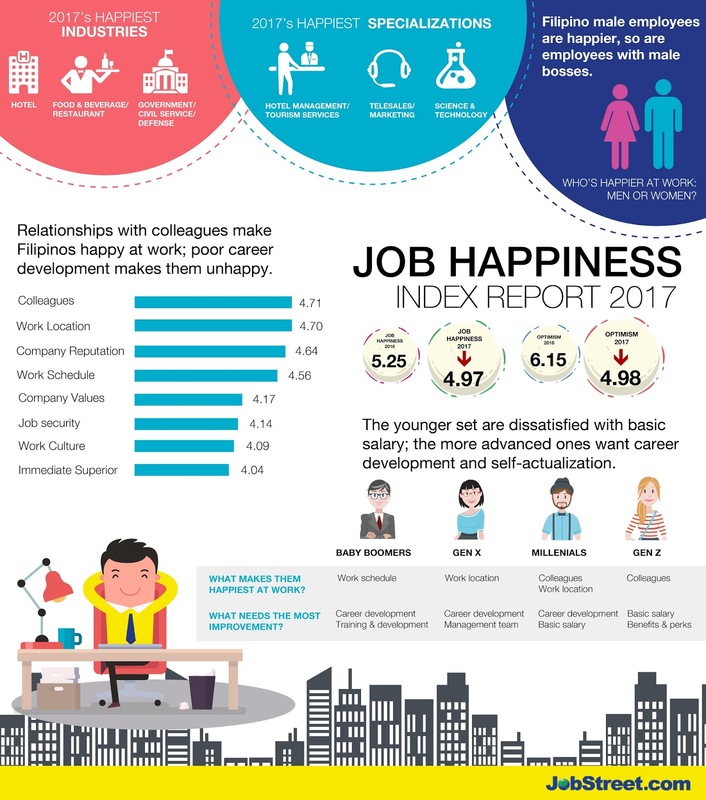 JobStreet.com Reveals: "Filipinos are Less Happy in the Workplace"
Correspondents said salary increase, getting a new job will make them happier in 6 months. The Philippines’ job satisfaction level dropped from 5.25 in 2016 to its current rating of 4.97 on a 10-point scale. According to JobStreet.com’s 2017 Job Happiness Index, the key factors associated with unhappiness at work are lack of career development and training opportunities, as well as the management style of a company’s leadership team. JobStreet.com surveyed 9,326 Philippine respondents from July 31 to August 31, 2017. The respondents were from different position levels (predominantly junior executives and supervisors) and represented a diverse mix of specializations. Fifty-six percent of respondents came from the National Capital Region, 12% from Southern Tagalog, 7% from overseas, 6% from Central Luzon, and 5% from Cebu City/Province. JobStreet.com is a leading online job board presently covering the employment markets in Malaysia, Singapore, the Philippines, Indonesia and Vietnam. JobStreet.com currently services over 230,000 corporate hirers and over 15 million jobseekers in its database.